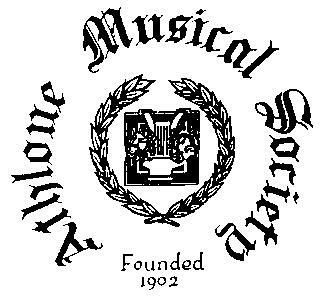 The society was founded in 1902 by Mrs Disney and Mr. Frank Haywood, whose names were synonymous with music and the musical stage in Athlone at the turn of the century. Concerts were held each year up to 1906 in aid of another old established sporting institution, Athlone boat club. In May 1907 the society produced it's first Operetta, "The Pirates Of Penzance", followed in 1908 and1909 with"The Mikado" and "The Yeomen Of The Guard" respectively. From1910 to 1918 annual concerts were the order of the day, with proceeds being shared with other local organisations. This year Athlone Musical Society presents Mack And Mabel. A U.K. director has made Athlone Musical Society the only amateur group with which he works - and he has arrived in town to spend three weeks putting the finishing touches to the Society's 2000 production, "Mack and Mabel" Johnny Worthy, who is based in London, has worked in the past with A.M.S., and was over some months back for the auditions for this year's show, which is to run at the newly refurbished Dean Crowe Theatre from March 25 to April 1. The Musical Director this year is to be Philip Shortt, from Loughrea, who has also been behind the Ballinasloe Musical Society's very successful show "The Hot Mikado"; and a team of professional musicians will be playing the orchestral arrangements throughout the show's run. "Mack and Mabel" is based on two real-life characters, Mack Sennett, and Mabel Normand, and was written by Gerry Herman, who is perhaps best known as the writer of the hit musical "Hello Dolly". Mack Sennett was the founder of the Keystone Studios, and Mabel Normand was a worker in a delicatessen, who was spotted by Mack, and brought to silver screen stardom. The musical focuses on the couple's on-off love affair. The title roles of Mack Sennett ang Mabel Normand will be played by Bernard Coyle and Majella Flanagan, both of whom have delighted audiences in the Athlone area over the years, having turned in terrific performances in major and demanding roles in many of the society's previous productions. Another local lady who has a major role in the forthcoming production is Sinead Farrell. Sinead made her debut with the Society in last year's production of "The New Pirates Of Penzance", and impressed audiences with her wonderful singing; and in this year;s show, she is playing the role of "Lottie". Malcolm Whelan plays the part of "Frank", and Paul Donnelly has the role of "Fatty Arbuckle". This new duo are bringing fine singing voices and comic acting skills to these parts. These two will be responsible for starting much of the slapstick and have been hand picked with this in mind. The big movie studio kings of "Mr. Kleinman" and "Mr. Fox" will be played by Alfie Kilduff and Benny Irwin. Neither of these need any introduction to Athlone audiences and both have by now recovered from thr rigours of Athlone Little Theatre! John McGlynn has the task of providing an alternative love interest for "Mabel" in the form of film producer "W.D. Taylor". John played the bad guy "Pirate King" last year, and gets to explore his nasty side again in Mack and Mabel! The part of "Ella" will be played by Sue Callaghan. Tony Dalton will play "Harry", Des Hennelly is "Andy", and Mick Kenna plays "Freddie". The Ladies' Chorus comprises: Michelle Daly, Clare McNally, Liz Digan, Brenda Bigley, Gael Kilduff, Adrienne McGlynn, Linda Murray, Ruth Donnelly, Lorraine Harney, Tracy O'Brien, Joan Larkin, Jennifer Shiels, Noreen Martyn, Schira Duffy, Sinead Gough, Michelle Donnelly, Orlagh Thornton and Angela Donnelly. The Men's chorus comprises: Colin Kelly, Colm O'Grady, Conal McKeever, Ray Conlon, Seamus Gilligan, Sean Feeney, Alan Shaw, Richard Dowling, David Moylan, Brian Curley and Tadhg Kelleher.